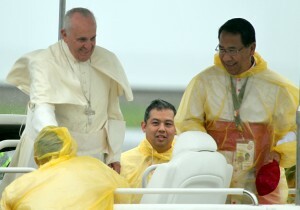 TACLOBAN City – Leyte Rep. Martin Romualdez yesterday thanked Pope Francis for blessing his constituents during Saturday’s Holy Mass here despite the heavy rain. He hopes that the Pope’s “personal touch” in expressing love and compassion to the super typhoon Yolanda survivors will expedite government efforts to rebuild the devastated areas. “We thank the Pope for this God’s big blessing he extended and shared with us. He comes at a time when we as a nation are going through one of the most trying and difficult times in our history. The prayers he sent to us were immeasurable help for our needs and salvation,” Romualdez stressed. “So far, this is best relief and reward to all of us here that God’s representative (Pope Francis) came and visited Tacloban City to comfort and assure (us) that our Lord is here for us,” Romualdez said. Romualdez reminded the public that the primary reason for Pope Francis’ visit to the Philippines was to personally comfort the survivors of Yolanda, the most powerful storm to ever hit land, with Tacloban City being the hardest hit area. “We should remember that Pope Francis’ historic five-day visit to the country was mainly to extend love and compassion for the Yolanda survivors,” said Romualdez. After Pope’s visit here, Romualdez expressed high hopes that the government’s rehabilitation work will be accelerated. “We are hoping that the Papal visit would expedite the rehabilitation of Yolanda-stricken areas. The country has been at the center of focus of the international community once again,” said Romualdez. “It is high time for the government to work double time and salvage the survivors from their poor living condition,” the solon added. Romualdez and his cousin Tacloban City Mayor Alfred Romualdez were among the few government officials who joined Palo Archbishop John Du in welcoming the Pope here yesterday. They embraced Pope Francis’ compassion for the plight of Yolanda survivors. Pope Francis officiated Holy Mass Saturday morning at Daniel Z. Romualdez Airport. After the Holy Mass, the Pope shared lunch with some Yolanda survivors at the Archbishop’s Residence before blessing the Pope Francis Center for the Poor. Yolanda pulverized the Visayan region on November 8, 2013, killing some 6,300 people, leaving 1,060 others missing, and damaging P25 billion worth of property and infrastructure.